Owing to the extreme conditions on the Venusian surface, it's going to be quite some time before a human ever steps foot on that planet. 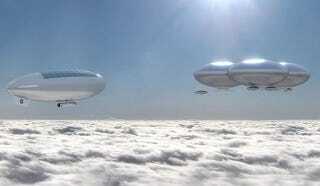 That's why NASA is developing a plan to deploy human-occupied airships in Venus's upper atmosphere. And yes, permanent occupation is the ultimate goal. As reported by Evan Ackerman in IEEE Spectrum, Dale Arney and Chris Jones from the Space Mission Analysis Branch of NASA's Systems Analysis and Concepts Directorate at Langley Research Center are currently exploring this very idea. The team says it'll be more practical to send humans to Venus before embarking on a mission to Mars. At 50 kilometers above its surface, Venus offers one atmosphere of pressure and only slightly lower gravity than Earth. Mars, in comparison, has a "sea level" atmospheric pressure of less than a hundredth of Earth's, and gravity just over a third Earth normal. The temperature at 50 km on Venus is around 75 °C, which is a mere 17 degrees hotter than the highest temperature recorded on Earth. It averages -63 °C on Mars, and while neither extreme would be pleasant for an unprotected human, both are manageable. At that elevation, astronauts would be able to tap into solar power and be protected from the sun's radiation. What's more, Venus is much closer to Earth than Mars; the entire round-trip would only require 440 days (as opposed to the 650-900 day mission to Mars and back). The robotic airship would be about half the size of the Goodyear blimp, solar-powered, and filled with helium. The crewed version, which would be about 426 feet (130 meters) long, would be covered with solar panels and have a gondola slung underneath. The crewed mission would involve a Venus orbit rendezvous, where the airship itself (folded up inside a spacecraft) would be sent to Venus ahead of time. Humans would follow in a transit vehicle (based on NASA's Deep Space Habitat), linking up with the airship in Venus orbit. Since there's no surface to land on, the "landing" would be extreme, to say the least. "Traditionally, say if you're going to Mars, you talk about 'entry, descent, and landing,' or EDL," explains Arney. "Obviously, in our case, 'landing' would represent a significant failure of the mission, so instead we have 'entry, descent, and inflation,' or EDI." The airship would enter the Venusian atmosphere inside an aeroshell at 7,200 meters per second. Over the next seven minutes, the aeroshell would decelerate to 450 m/s, and it would deploy a parachute to slow itself down further. At this point, things get crazy. The aeroshell would drop away, and the airship would begin to unfurl and inflate itself, while still dropping through the atmosphere at 100 m/s. As the airship got larger, its lift and drag would both increase to the point where the parachute became redundant. The parachute would be jettisoned, the airship would fully inflate, and (if everything had gone as it's supposed to), it would gently float to a stop at 50 km above Venus's surface. But once there, and situated near the equator, the astronauts could ride along the 100 m/s winds and circle the planet in just 110 hours (Venus itself barely rotates). Working in the airships, the astronauts could assess the environment for eventual human missions. They could also bring small robotic landers with them to scour the blazingly hot and heavy Venusian surface (its 500 degrees C with 92 atmospheres of pressure down there). "It would take a substantial policy shift at NASA to put a crewed mission to Venus ahead of one to Mars, no matter how much sense it might make to take a serious look at HAVOC," concludes Ackerman, "But that in no way invalidates the overall concept for the mission, the importance of a crewed mission to Venus, or the vision of an eventual long-term human presence there in cities in the clouds." There's much more at IEEE Spectrum, including more conceptual images and diagrams. Images: NASA Langley Research Center.